Happy almost end of a solar orbit! As the year draws to a close I’ll be putting up my Best Ofs of 2015. At the top of each post will be a link to the Pinterest board connected to them, every cover and title will be an Amazon buy link so if something sounds fun, go get it for yourself. I read more books this year than any previous year this century and the overall standard was ludicrously high. There was some amazing stuff published this year, including Planetfall by Emma Newman, The Vagrant by Peter Newman, Uprooted by Naomi Novik, Into the Nanten by Jay Swanson , the astonishing Imaginary Cities by Darran Anderson and every single thing put out by the Tor novella line. Of the 100 or so books I read this year, there’s not a single one that isn’t worth your time. But the five that really stunned me are below. Like every reader I have a laundry list of things that will make me pay attention. ‘Shakespeare’, ‘Star Trek’ and ‘What Happens After The World Ends’ are all on that list. They’re also all central to Station Eleven. Mandel’s story is, like several others on my list, about stories. It starts with a performance of King Lear which, unknown to everyone there, will be one of the last plays ever put on in the old world. As the Georgia Flu sweeps the planet, the novel jumps around in time using that play as its starting point. We see the life of Arthur Leander, the lead who dies on stage. We meet his family, follow one of the child actresses in the cast and audience members. We see their lives before the play, we’re with them as the Flu takes them and, most interestingly, we see what comes after. This is the kindest post-apocalyptic novel you’ll read. It has teeth, certainly, but it also pays attention to what so few others bother with; the people. The Flu breaks those it doesn’t kill and, as ever, those it breaks heal differently. The beauty of the novel is in its refusal to judge those survivors. Instead Mandel explores the difference between those trying to rebuild and those trying to simply build. The world is different, the stories are different and the characters who ultimately succeed are the ones who accept that. Gentle, compassionate and immensely subtle Station Eleven is a novel that’s rung like a bell down through 2015 and will haunt you in the very best way. We picked this up at Borderlands in San Francisco when we were there over the Summer. Trapped in the cheerfully apocalyptic traffic the Bay Area sometimes enjoys, we passed the time by reading the first couple of sections of this aloud. When the traffic started moving again, we were mildly disappointed. That’s how good this is. 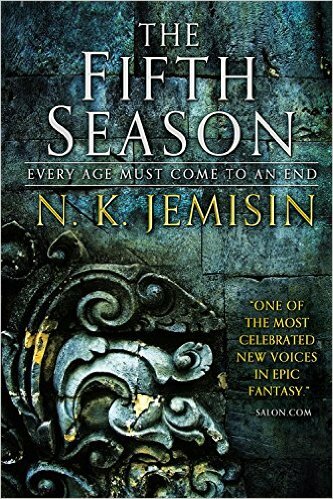 Jemisin starts at the end of the world and works backwards. It’s a gutsy choice and it absolutely pays off as she uses the lives of three different women to explore the two different ways the world is ripped apart. The first is through the Fifth Season, regular cataclysmic changes to the climate and environment. The second is through the Orogenes, humans who can control the Earth and who are themselves controlled by an organization built on their backs and designed to control them. Issues of gender, class, family and human rights collide with a vast plot and three beautifully realized central characters to create something extraordinary that surprises the reader more than once. Unique, innovative and like the book below, has me counting the days to the sequel. The return of Wydrin, Sebastian and Frith from Jen Williams’ excellent The Copper Promise did everything a sequel should do and then some more. The consequences of the first book are neatly wrapped around a new job, a new area of the world, some romance and a lot of classic Wydrin banter. Jen excels at fantasy worldbuilding that feels earned rather than necessary. In the space of a few pages you get what’s going on. In the space of a few more you understand why and by the end of the book she’s walked you through a spectacular and very different culture on their very worst day. Even better she’s also moved the plots of her three leads along and ensured that, as ever, none of them ever get away with everything they try. This is fantasy that’s light on its feet, has one eye on your wallet and another on the door. Another belter from one of the best new voices in modern fantasy. If there’s a common factor in my books of the year it’s their willingness to mess with their readers. All five are playful, witty stories that turn on a dime and never quite let their readers get comfortable. Revision isn’t just an example of that, it builds that idea into the core of the story. Andrea Phillips’ story starts out as a Banksian modern comedy. Mira is a trust fund baby who has struck out on her own, has a good job at a coffee shop and is making her way on her terms. Her boyfriend, Benji, is a tech startup CEO. He’s working on Verity, a news aggregator that’s designed to incorporate everything and do so with absolute accuracy. Which is why it’s a perfect revenge choice for Mira, who edits Benji’s own Verity entry to show they’re engaged. Then, the same night he dumps her, Benji returns and proposes to Mira. As the novel goes on, and Mira goes further down the rabbit hole, Philips keeps the light, witty approach but adds a shot of espresso to it. This is a novel about the bleeding edge of science and who bleeds to get us there. The ethical questions it raises are huge and chewy and taken apart here with immense perception and enthusiasm. Not to mention versatility, with Phillips shifting gear from comedy to darkness to techno thriller without ever missing a beat. Even as Mira stumbles to try and keep up with her increasingly surreal life. Revision is a mercurial story about the consequences of the stories we tell ourselves. And, worse, the stories told about us. Endlessly inventive, acutely observed and sharp it’s unlike anything else you’ll read this year and unlike anything you’re expecting it to be. This book helped me mildly worry a train load of people. Riding back from Nottingham, I giggled and snorted my way through the first couple of hundred pages of Chris Bucholz’s story and devoured the rest in short order once I got home. I still laughed, a lot. I just had less people to worry and less need to behave. Which is fortunate as this is very very funny. Set aboard a generation ship nearing the end of its voyage, Severance is equal parts thriller, comedy and horror. The horror comes from the central conspiracy and the grounded, mundane reasons for it. The thriller comes from what happens when you go to war in an enclosed space and the comedy comes from everything. Bucholz has an incredible sense of comic timing and his two leads; a pair of cheerfully disgruntled engineers who are fond of recreational burglary, are my favourite double act of 2015. The phrase ‘like a fat whisper’ alone makes the book worth picking up and please, please do. It’s amazing.